2:30pm CDT: This afternoon we checked in, collected our passes, and took a brief walk around the trade show floor. The huge space doesn’t officially open until tomorrow, so currently everyone is scrambling finish setting up the intricate displays designed to show off their wares. Some of the biggest areas belong to General Cigar, Altadis, Rocky Patel, Oliva, Ashton, Davidoff, and the Cigar Family (seen below). Other booths are smaller and more modest. 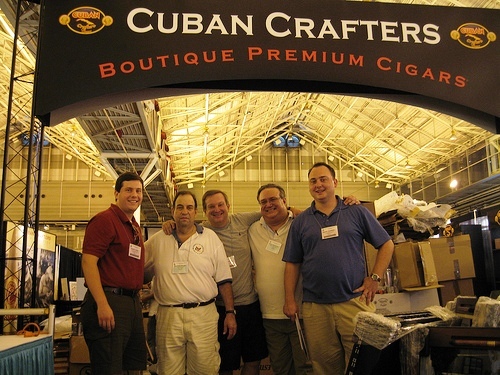 3:30pm CDT: While walking the show floor we ran into our good friend Alberto Noguera of Cuban Crafters, who introduced us to Don Kiki Berger. Kiki told us how his father fled Poland during the run up to World War II and eventually settled in Cuba where he learned the tobacco trade. He also told us about his new smoke, Entubar, which is releasing under the Berger & Argenti brand. Pictured below (from left to right) are Patrick A, Kiki, Steve Ashby (Patrick A’s father), Alberto, and Patrick S.
4:00pm CDT: In our preview on Thursday we mentioned Arganese was creating a two-in-one cigar designed to minimize the SCHIP tax. 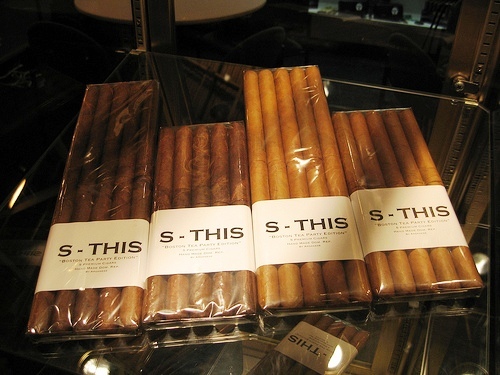 Below is a photo of the cigar, called “S-This.” What might not be clear from the photo is the cigar is really two smokes, connected at their heads with an extra bit of wrapper that can easily be removed by the smoker. So while for tax purposes the consumer is buying five cigars, in reality they get ten smokes. Sneaky. 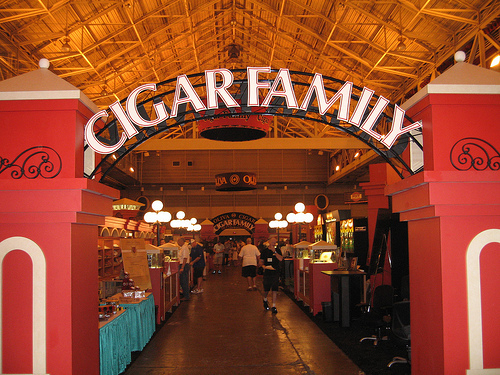 4:30pm CDT: We overheard that Louisiana’s cigar excise tax is being applied to cigars given away on the floor. If so, it could put a damper on the number of samples that makers will be giving out. We’ll be following up with more details on this story, but rumors are the tax may be as much as $1 per cigar.